Fed stance lifts markets. The benchmarking indices closed on a firm footing after Fed minutes indicating no hurry to raise interest rates, besides the rally was supported by global cues. Mumbai: The benchmarking indices closed on a firm footing after Fed minutes indicating no hurry to raise interest rates, besides the rally was supported by global cues. The experts believe that the current rally is based on the liquidity and the future of the market trend would depend on the Bihar elections and Fed rate hike apart from September quarter earnings. 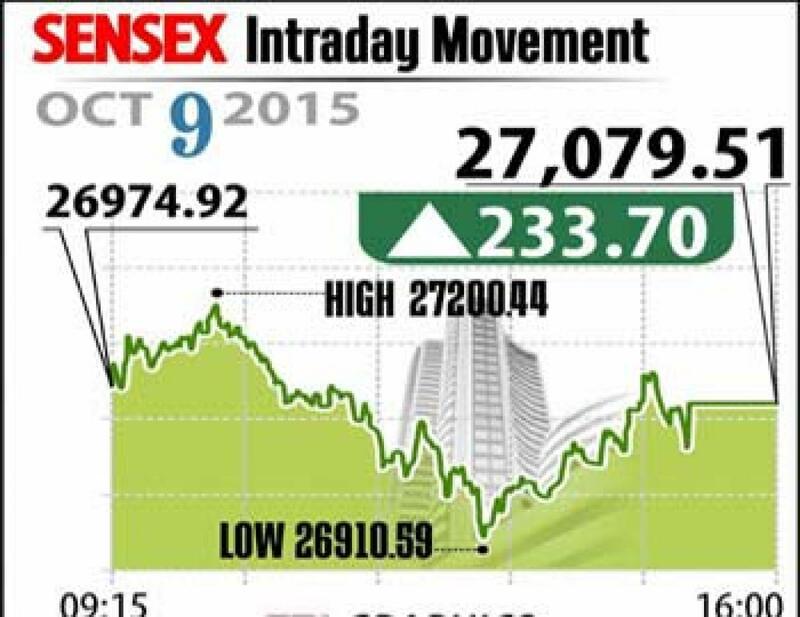 Sensex closed the session up 234 points at 27,080 and Nifty up 60 points at 8,190. The broader markets showed mixed trend with midcap down by 0.1 per cent and smallcap up by 0.2 per cent. On the sectoral front, 9 out of 12 sectors ended on a strong note with IT index closed up 1.5 per cent followed by metal index up by 1 per cent. While consumer durables index fell 0.2 per cent. With the news that, besides reducing capex and opex, the mining major Vedanta plans to enter solar segment in India. The scrip finished up 12 per cent. While Hindalco closed up by 1.6 per cent and Tata steel soared 4.2 per cent. From oil marketing pack, the stocks fell on the rising crude prices with BPCL, IOC, OIL, HPCL down up to 2 per cent each, while ONGC up 2.1 per cent. And in the banking space, ICICI Bank up 2.8 per cent whlie Axis Bank, HDFC and SBI closed flat with negative bias. The gainers: Vedanta, up 11.58 per cent at Rs 103.60; Tata Steel, up 4.26 per cent at Rs 250.75; Tata Motors, up 3.81 per cent at Rs 355.90; Infosys, up 3.13 per cent at Rs 1,167.85; and ICICI Bank, up 2.75 per cent at Rs 286.10. The losers: Coal India down 3.05 per cent at Rs 335.65; Maruti, down 1.87 per cent at Rs 4,272.80; Sun Pharma, down 1.00 per cent at Rs 906.35; BHEL, down 0.88 per cent at Rs 202.05; and Hindustan Unilever, down 0.51 per cent at Rs 817.20.